Death and sleep, sleep and death. Is one just a vast version of the other? Do just people sleep better? And do they have a more comfortable death as a result of being just in life? The mystery of what happens when we leave this world rises up to haunt us when we are unable to avoid it. And the art of the dead decorates every church in the land. We think nothing of it; we do not give it a second thought. Nevertheless, churches remain great echoing necrostic galleries to this form of art, which endures as an expression of bafflement in the face of Eternity herself. One such gallery towers over Salisbury and has done for more than 900 years. Salisbury Cathedral is a magnificent mausoleic creative space where man has daubed his speculations, his dreams and nightmares, about the form that most final sleep might take. It has its usual ghastly mediaeval cadavers and stalwart alabaster knights; but like many other churches, it is the strange bas-reliefs of the 17th century which retain the most marked ability to unsettle us. There is not enough historical detail to tell her story, just dry dates and one unsettling phrase regarding her will. At 21 in 1577, she married a Buckinghamshire lad, John Davy, and after his death wed Jasper Moore who was knighted in 1603. When Moore died it was discovered he had made several alterations to her will in his favour, each more generous than the last. Whatever the reason, she cannot sleep. Her magnificent pillared monument where she sleeps next to her husband has her staring, insomniac, at the ceiling. I have not seen staring sleepers like this, and with my 21st century brain draw the conclusion that the sleep of the just evaded her. But maybe she and her husband are just very ready indeed for the second coming. 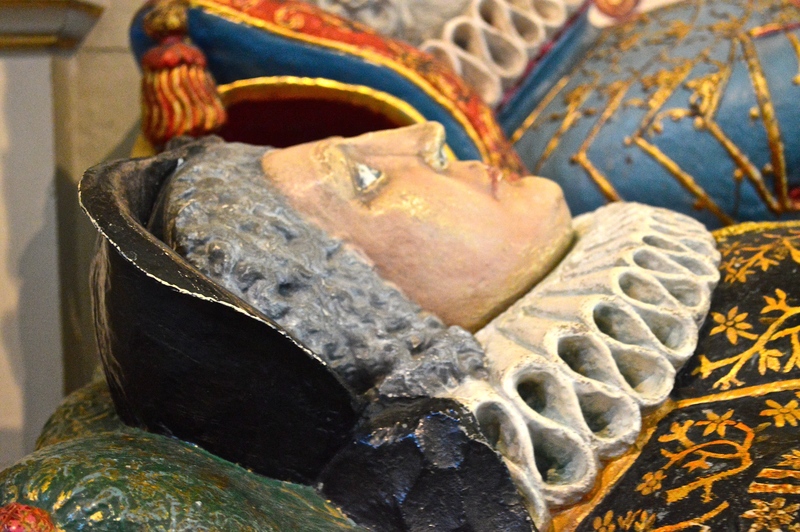 Posted in Quirks of HistoryTagged anglophile, Britain, england, heritage, history, katherine Mompesson, mompesson tomb, Richard Mompesson, Salisbury CathedralBookmark the permalink. This is the look of a parent whose child is teething, methinks! A sort of aghast stasis, Chris. Interesting post Kate considering that I’m reading it at the airport waiting to catch a flight west as my dear old dad jn SF prepares to shed his mortal coil. My sister told me that she has noticed him lying still and glassy-eyed. Maybe this is just one of the final pages of the last chapter in the book of life? Virginia, my timing is abominable. Really sorry to hear about your dad. Safe journey, and arrival. And maybe you are right:maybe it’s just a stage. Just my usual night of hardly sleeping. 😀 That’s it, Celi. You’ve got it. To have to be vigilant in death…. What an elaborate monument and quite eerie if stared at too long. It is a little frustrating not knowing the details of that “strange will,” isn’t it! This is the stuff of a good mystery novel, Kate! It is, Debra – but we’d end up having to make it all up: the really old stuff is usually documented in the most mundane places – this reference came from a set of parliament papers, a letter from someone. We have death and birth nd marriage records, details of the wills and finance associated with them. It’s a little scant..
On the morning of July 2nd this year, I quipped to my Sis, “I told you I sleep the sleep of the just” when I learned I had slept right through the F1 tornado that rolled across our neighborhood at 1:30 a.m. 🙂 I can tell you my eyes were decidedly NOT open or I’d hardly have been so blase’ about it! That said, Debra is right, the longer I look at that picture you’ve shared, the more I think Katherine may have died in a state of terror. How horrible to be consigned to that for eternity. It would be really interesting to know the story behind the open eyes, Karen, or other examples of open-eyed monuments.Her will, and previous examples of the wills with which she had been involved, were certainly rum. A very strange business. I love your mind, Kate! Definitely unsettling. More and more so as the minutes go by. Made me laugh out loud, Kate ~ thank you! Marvellously ghastly. Perhaps a pesky mosquito flies around her head. Can you imagine the eternal high-pitched hum? Poor Lady Mompesson! I think she needs to switch to decaf. Loved the odd juxtaposition of The Bee Gees singing “Staying Alive.” I could never hit those high notes. No: i think it requires very tight trousers. I do love these effigies, though. One of the only ways we have to tell what these people looked like, what size they were, etc. She does look a bit gruesome,Andra! The effigies are amazing. I have begun collecting likenesses like these in a file. How people really looked. So much like they do today, yet separated by a chasm of time. Many thanks for helping out with Mad’s birthday present, BTW. She is going to be completely sent! I’ve had enough insomnia in this lifetime to last an eternity. I hope when I shuffle off the mortal coil that sleep comes easily. The idea of staring into the abyss for thousands of years is disconcerting. It is. I agree. Oblivion sounds quite attractive when you put it like that! Maybe she is determined to stare down any potential grave robbers. I defy any robber to get past that, Brenda! Good call! Perhaps she’s keeping vigil to ensure no one else will change her will. A bogeyman in the ceiling? Thanks so much Frances! Heading over to read now!